Four Things You Believe About Stamped Concrete That Aren’t True! Stamped concrete has an undeniably great look. It is versatile and blends-in well with a wide range of home styles. Whether you live in a log cabin in North Carolina or a beachfront bungalow in South Carolina, you can make stamped concrete work on your property. If you’ve been thinking about using this material as a feature in your yard, but haven’t yet taken the plunge, it’s probably because you believe several purported facts about stamped concrete that are not true. This guide is meant to clarify these myths. Many homeowners are under the mistaken impression that stamped concrete is significantly more expensive than other materials on the market. In truth, although stamped concrete typically has a very upscale look, its price point is on par with similar options, like geometric pavers and natural stones. Furthermore, because stamped concrete that is properly maintained can last for decades, it’s an incredibly cost-effective choice since you won’t have to replace it or have it repaired frequently. 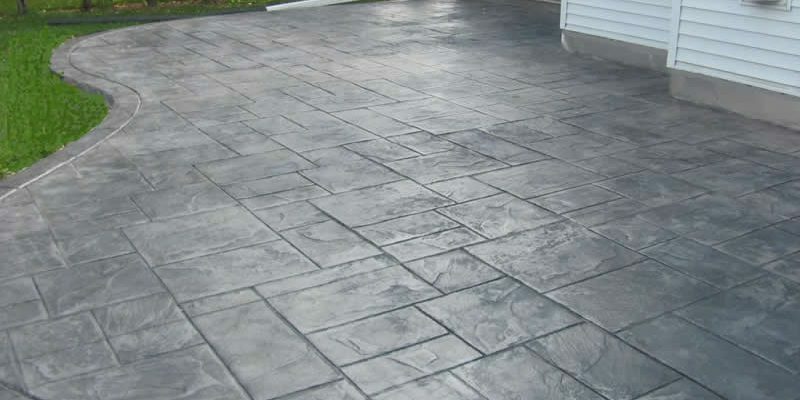 It’s not uncommon for people to think that the color of stamped concrete, which is an integral part of its overall appearance, will fade quite quickly, making it look like a standard concrete slab. Although it is true that this type of concrete will fade over time if it is not cared for, maintenance is quite simple. All you need to do is have a high-quality sealant applied once per year. It is best to let a professional handle this job, though you can try to tackle it yourself. As long as the color is adequately sealed, your stamped concrete will look like new for many years. Another myth about stamped concrete is that it will quickly begin to deteriorate, cracking and showing signs of wear. Although all stone eventually starts to crack and break down, as long as you properly maintain your stamped concrete, it will serve you well for a long time (probably longer than you live in your house!) Making sure it is professionally installed and sealed every year will go a long way toward protecting your new concrete from damage. While pavers can be arranged in intricate patterns, they actually take quite some time to install in an elaborate fashion. Depending on the size of a patio or walkway, it can take weeks for even the most experienced contractors to finish paver designs; for do-it-yourselfers, it could take even longer. Stamped concrete, however, also has an intricate look without nearly as much effort. In some states, stamped concrete is even considered a preferred installation choice because it requires few labor hours and very little equipment. All-in-all, stamped concrete is an excellent choice for whatever outdoor project you’re working on. Whether you’re thinking about installing it around an inground pool, creating a beautiful patio in your backyard, or adding walkways around your property, it’s an excellent material that will add beauty to your space.